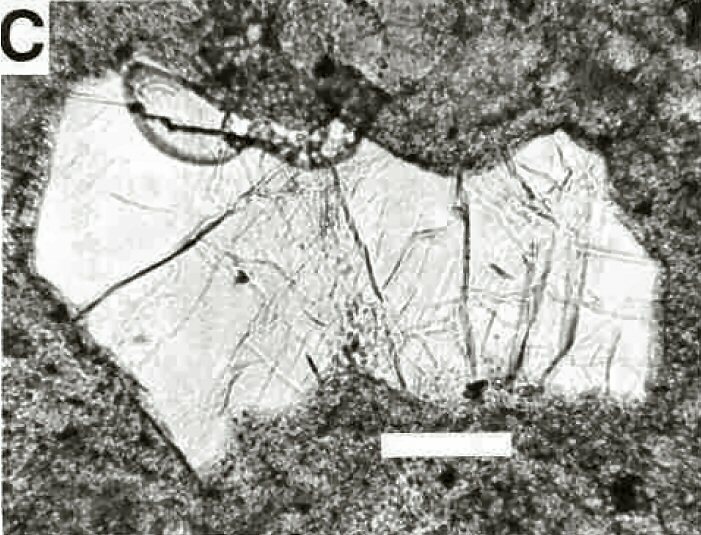 Comments: B&W image of the largest yoshiokaite crystal yet found (grain #23); note fracturing probably caused by shock deformation and the groundmass of regolith glass. (AmMin v75:676). Location: At a distance of about 224 m from their Apollo 14 lunar lander, in the bottom of a 30-cm-deep trench, Mitchell and Shepard collected the two-gram rock that is regolith breccia 14076. Scale: Scale Bar 50 µm.